We present an extension of the SKaMPI benchmark for MPI implementations to cover the derived datatype mechanism of MPI. All MPI constructors for derived datatypes are covered by the benchmark, and varied along different dimensions. This is controlled bya set of predened patterns which can be instantiated bypa rameters given bythe user in a configurationsle. We classifythe patterns intofixed types, dynamic types, nested types, and special types. We show results from the SKaMPI ping-pong measurement with the fixed and special types on three platforms: CrayT3E/900, IBM RS 6000SP, NEC SX-5. The machines show quite some difference in handling datatypes, with typically a significant penaltyfor nested types for the Cray (up to a factor of 16) and the IBM (up to a factor of 8), whereas the NEC treats these types very uniformly (overhead of between 2 and 4). 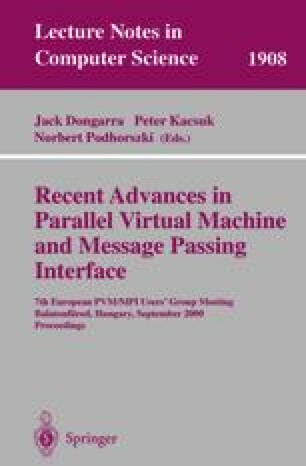 Such results illustrate the need for a systematic datatype benchmark to help the MPI programmer select the most efficient data representation for a particular machine.